Camouflage tolling ducks group 4 in wetlands camo pattern. 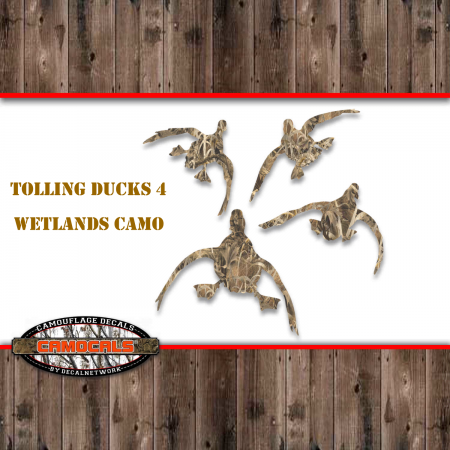 Our camo decal also know as "CAMOCALS" are made from high quality vinyl material, printed with UV inks and laminated with a glossy clear finish for extra protection from outdoor elements and fading. We off this design in three sizes. 9.5"x 10". Contact us if you need another size option. Our decal are outdoor weather resistant, great for vehicle applications, car window, truck window, SUV window. These decal will stick to any clean smooth surface. Use them indoors as well. Works on lap tops, computer cases, mirrors, metal lockers. Larger decals are great for custom corn hole boards. Use your imagination! Decalnetwork has been making high quality vinyl decals since 1999. We love what we do and we can make custom decals for any subject, from novelty to business and commercial graphics. You may see from a lot of our designs that we have a passion for the outdoors and hunting, fishing, wildlife and camo styles.